Manufacturers often offer product models that are essentially variations of an existing product. 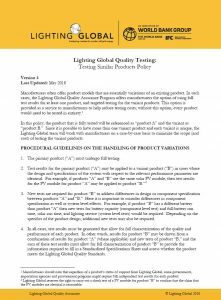 In such cases, the Lighting Global Quality Assurance Program offers manufacturers the option of using full test results for at least one product, and targeted testing for the variant products. This option is provided as a service to manufacturers to help reduce testing costs; without this option, every product would need to be tested in entirety. The Lighting Global team will work with manufacturers on a case-by-case basis to minimize the scope (and cost) of testing the variant products.